What is the now “legendary” Ulverston Dickensian Weekend takes place during the last weekend in November in our neighbouring market town of Ulverston, only a ten minute car Journey away from the hotel. The townsfolk do a tremendous job converting the whole town into a scene resembling one from of Charles` Dickens famous tales itself! The Whitewater Hotel itself has history going back even further than the mid 1800s, but we don’t aim to compete with events taking place during this fabulous event. What we can do however is provide the perfect base for you to enjoy all the magical goings on, so we are offering a two night break designed to let you take a step back in time whilst coming back to all the creature comforts our riverside retreat has to offer. 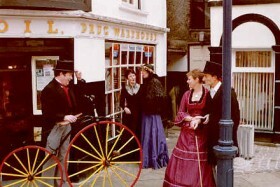 Two nights bed and breakfast in a standard room and a “Dickensian” themed dinner on one of the nights you stay!! Full use of our leisure centre is included to allow time for a swim, sauna, steam or spa pool session. Escape to the past with all this for only £189 per couple!! Stay any two nights over the weekend of 23rd, 24th & 25th November 2012. Call now on 01539 531133 to make your reservation.